Makerbot made a big splash last month when they announced the successor to the popular Replicator 3D printer: the Makerbot Replicator 2. The new model improved resolution from a 270-micron layer height to just 100 microns, increased its build volume to 410 cubic inches, optimized it for PLA, and gave it a sleek and sturdy new steel shell. On top of that, Makerbot also introduced a complete software update called MakerWare, which brings faster and more consistent printing. The new slicing engine is up to 20 times faster than the previous technology. There are quote a number of options these days at around the price of $2,199, so you want to do get as much information as possible before deciding upon which 3D printer you might buy. To help learn more about the Replicator 2, you can watch these just-released, brief introductory videos for the machine and its software. Together, they run about 22 minutes total. Okay, I don’t know if you really need a video to show how to take the machine out of the box and set it up, but I’ve included it here anyway as it gives those unfamiliar with the Replicator 2 another view of the 3D printer. Here’s a walk-through of the Replicator 2 startup process, how to level the build platform and load your PLA filament. This video tutorial will show you how to load a file into MakerBot MakerWare, move it, scale it, and make it. 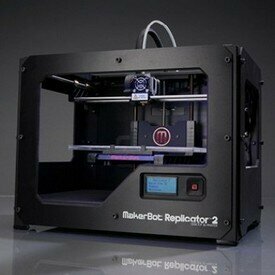 MakerWare is the new software with which you’ll prepare models for being made on your MakerBot Replicator 2. All 3D printers require some maintenance. The MakerBot Replicator 2 has a simple occasional, maintenance routine in which you lubricate the threaded rod and clean out the drive gear. If you want to see a Makerbot Replicator in person, and you’re in the New York City area, you can also head over to their frist of it’s kind, brick and mortar retail location at 298 Mulberry Street in the NoHo neighborhood of Manhattan.